NOW AVAILABLE WITH SIZE SELECTION IN THE DELUXE MODEL. 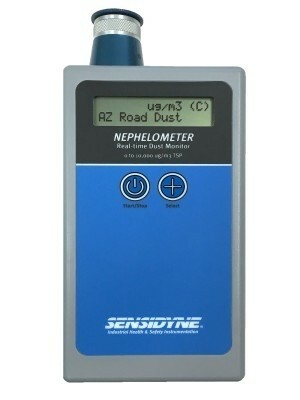 The Sensidyne Nephelometer is an advanced real-time dust monitor (aerosol monitor) accurately measuring dust concentrations using proven light scatter technology. This portable instrument accurately measures and records dust from 1-10,000 μg/m3 with resolution to 1 μg/m3. Sample modes are selectable between 60 second sample, 15 minute STEL, or continuous sampling. The Nephelometer has an internal pump drawing samples into the iso-kinetic sampling inlet where they meet sheath air that guides samples past the particle sensor. The sensor is a photo detector that measures laser light scattered by particulates in the sample stream. The instrument multiplies each measurement by a K-factor and displays the real-time reading on the display of the instrument. After each sample, the K-factor and Environmental Factor Name and STEL, maximum, minimum, and average readings record to the internal data log. When connected to a computer the instrument uploads up to 4,000 data-log records in spreadsheet format. 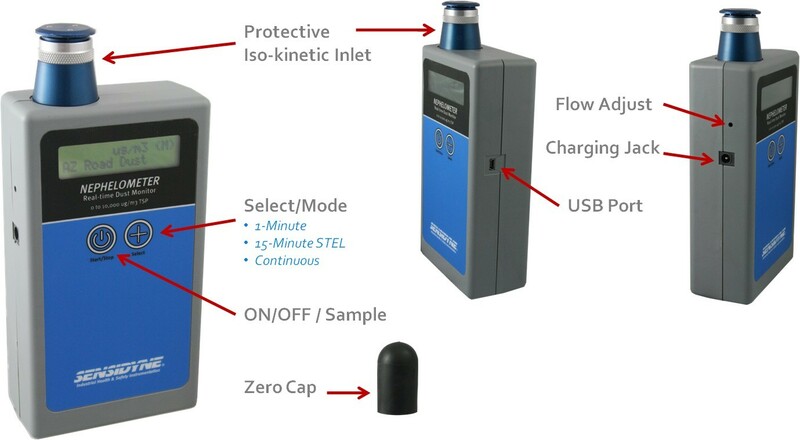 In addition to high sensitivity and ease-of-use the Sensidyne Nephelometer offers a low cost of ownership, automatic power save, long-life, data-logging, facility monitoring features, and user-replaceable filters. The Sensidyne Nephelometer is a competitive, well priced alternative to high priced aerosol monitors. Power: 7.2V Lithium Ion self-contained battery pack providing 30 hours of typical intermittent operation and up to 12 hours continuous use. Charger: 100-240VAC Lithium Ion Charger 8.4VDC @ 1500mA typical. Standard Calibration: Arizona Road Dust. K-factors allow direct reading of other substances. FDA / CDRH This product is tested and complies with 21 CFR, Subchapter J, of the health and Safety Act of 1968. Supplied: Operation manual, Charger with power cord, zero cap, spare filter, software and USB cable. Warranty: One year from date of shipment. *picture is shown with optional boot.